Judge Dee: The City God Case is an adventure puzzle game by BiP Media. We play the role of Dee's judge investigating the mysterious curse over the town of Wu Ling. A number of puzzles and logical challenges await a solution. 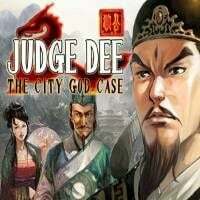 Judge Dee – The City God Case makes it to be immersive. It is possible to move easily/freely in a magnificent City, in the streets, in some apartments or shops and into the nature of this medieval China. This exotic adventure will make you explore some splendid and faithfully sceneries, in which you will be led to discuss and interact with numbers of characters: shopkeepers, guards, dignitaries, beggars… In the corner of a street you also can challenge the player of Go which will give you some Dragon Points. Dragon points are very helpful to get some advices when you try to solve puzzles. Your powers of observation and ability for reflection will be severely tested in order to solve the many mysteries that haunt the City. Judge Dee – The City God Case wants itself to be accessible to everyone. Three levels of difficulty can be chosen to match any type of player: those who like challenge, intermediate players or those who prefer to concentrate on the story. The map of the city helps the player to identify where he is and where is his next objective. It is even possible for the player to skip a puzzle considered too much complex to come back to it later. In addition, a tip system can help the player go through some difficult situations especially during hidden object or puzzle phases.